What is blepharitis and meibomitis? 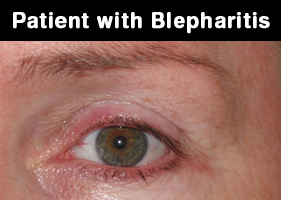 Both the condition of Blepharitis and meibomitis occur simultaneously. Eyelid margin inflammation us termed as Blepharitis, and if oil glands which are present in eyelid gets inflamed it is termed as Meibomitis. Both the conditions blepharitis and meibomitis are incurable with allopathy system of medicine. Due to non functioning or malfunctioning of oil glands in eyelids blepharitis and meibomitis condition arises, as a result there is inflammation of eyelids and there after the bacteria that reside on eyelids gets invaded leading to infection. If this condition is not treated propery it may result in styes, chalazae , corneal ulcers, etc. 1.Anterior blepharitis:- When outside front of eyelid is affected it is termed as anterior blepharitis. Commonly caused by staphylococcal blepharitis bacterial infection or seborrhoeic blepharitis, due to dandruff on scalp or eyebrows. Burning, itching and irritation with a sensation of foreign body in eyes. Redness of the eyes and eyelids. Flaky skin on the lids. Hordeolum-Cysts at the lid margin. Treats infection and helps in reducing inflammation of eye lid. We have more than 188 homeopathic medicine which can be used for blepharitis and meibomitis, but the correct selection can only be done by a qualified homeopathic doctor on the basis of proper case taking.